Environmental sustainability issues are an important topic we must ensure we never stop talking about if we want to live on this amazing planet for many more centuries ahead. Recycling is the word and REN Clean Skincare are on top of it. They have started work on their ‘Clean Planet Initiative‘ and strategy to become a zero-waste brand by 2021 and use 100% recyclable, reusable, compostable packaging for its products. Their ethos and approach to keeping this planet clean by making every effort to make their products recyclable is truly commendable. It’s also a good piece of mind to know by choosing them you’re helping reduce your waste footprint too! Not only do I admire the passion REN have on taking care of our environment waste wise, they are also cruelty free and vegan friendly. So you can be sure none of your money is going towards hurting our planet or its animals. The latest edition to the brand is the REN Clean Screen Mineral SPF30, which has taken 6 years of research to make sure its protective, comfortable and nourishing for the skin but also equally kind to the planet as well. After seeing how much research and time went into this product and being a big REN fan I was excited to get my hands on it and see if it lived up to the companies usual standard. 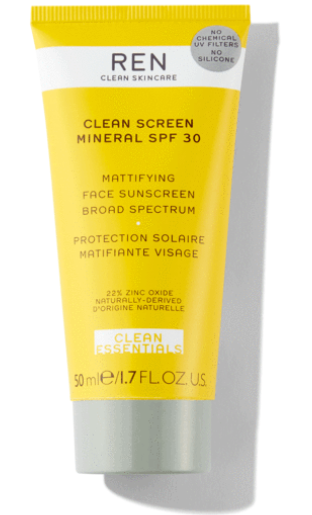 I have used the Clean Screen Mineral SPF 30 for over a week now and I would highly recommend everyone to purchase this, you can find it retailing at £30 on their website. It is the ideal purchase for the coming summer months to stay safe and look good doing it! Forms the perfect base if you want to apply foundation afterwards as there is no greasy finish. This is thanks to the added ingredient rice startch which allows for a natural matte finish effect. It’s silicone free, a vegan formula and cruelty free certified. The ingredients are all natural to the skin and the environment. The mineral ingredients are much better for ocean environments, whereas other chemical sunscreens have been shown to potentially harm marine life.